Last edited by Austranada; Apr 12, 2019 at 19:09. Do you wake up every morning reading about all the things that can kill you in life? Maybe you should, and put it in your household and make it compulsory reading by all inhabitants. Then go put you tin foil hat on and bubble wrap and write a response calling me an idiot or whatever derogatory words you would like to use for the day. Apr 13, 2019 | 08:24 3 I think guys like this target glyphosate partly, because it gives conventional farming a huge advantage over organic. It's also a big marketing ploy to scare people towards buying organic food. The only problem is, they don't really want it outlawed or they won't have the glyphosate bogeyman to try and scare people away from. Fear and emotion are what sells. I think guys like this target glyphosate partly, because it gives conventional farming a huge advantage over organic. Last edited by AlbertaFarmer5; Apr 13, 2019 at 10:05. Interesting how you always create scenarios to worship. Its also called paranoia. At the current rate that change is happening now, how long do you think there is before "production ag" (whatever you think that is) collapses? Oh I see, it will always dominate just like smoke signals to communicate. Apr 13, 2019 | 21:01 8 Austranada I would let you in on secret. 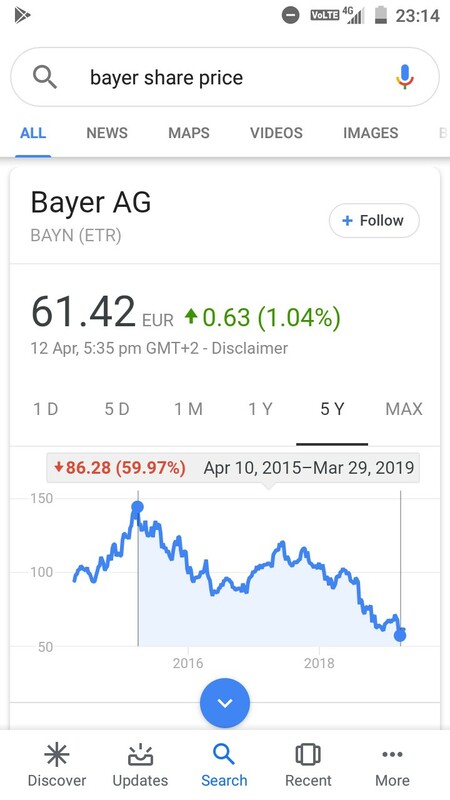 As a proponent of organic agriculture you see conventional farmers who use products from Bayer and the former Monsanto as farmers who love those companies. For the most part farmers hold many of the crop protection companies with distain mostly because of their pricing point for many of the products. Many of us are loath to defend those companies. That being said the advent of glyphosate created the opportunity to direct seed and has revolutionized agriculture in the semi arid areas of western Canada. I remember the blowing soil of the 1980's just as my grandfather saw the blowing soil of the 1930's. This has been basically eliminated since farmers started direct seeding with the use of Roundup. Soil heath above all is the thing that make the land able to sustain future generations of my family should they chose to farm. We have soil tests for some of our land going back to the mid 1960's to today and the growth of organic matter since direct seeding began is remarkable. Fellows like Guy Lafond and Jim Halford led the way. We are growing crops with a diverse rotation that would have been unheard of in the old days. Organic agriculture has a place in Saskatchewan. There is organic farmers in my district that are very successful and are very interesting to talk to about their cropping systems and marketing endeavors. That being said there is a lot of other organic farmers who seem to get into organics because they cant afford fertilizer and other inputs. Their neighbours fields are polluted with all the Canada thistle fuzz blowing off in the summer. Many local organic fields turn yellow with wild mustard for a couple weeks every year until the petals fall off. You bashing conventional farming is not going to gain many converts. When you look at the young people getting into agriculture these days for the most cases they are part of a large successful conventional farm. Maybe its just me but I would be hard-pressed to find many organic farms that have enjoyed the financial success that many conventional farms have. Maybe a newer pickup, shop, big flat bottom grain bins, and the odd warm holiday are not an indication of success but it cant be far from it particularly if it spans more than one generation. If you Austranada are really sincere in believing that we should "see the light" and not being the troll to get under our skin, Im all ears. We all want to make more money. Austranada I would let you in on secret. As a proponent of organic agriculture you see conventional farmers who use products from Bayer and the former Monsanto as farmers who love those companies. For the most part farmers hold many of the crop protection companies with distain mostly because of their pricing point for many of the products. Many of us are loath to defend those companies. That being said the advent of glyphosate created the opportunity to direct seed and has revolutionized agriculture in the semi arid areas of western Canada. I remember the blowing soil of the 1980's just as my grandfather saw the blowing soil of the 1930's. This has been basically eliminated since farmers started direct seeding with the use of Roundup. Soil heath above all is the thing that make the land able to sustain future generations of my family should they chose to farm. We have soil tests for some of our land going back to the mid 1960's to today and the growth of organic matter since direct seeding began is remarkable. Fellows like Guy Lafond and Jim Halford led the way. We are growing crops with a diverse rotation that would have been unheard of in the old days. Organic agriculture has a place in Saskatchewan. There is organic farmers in my district that are very successful and are very interesting to talk to about their cropping systems and marketing endeavors. That being said there is a lot of other organic farmers who seem to get into organics because they cant afford fertilizer and other inputs. Their neighbours fields are polluted with all the Canada thistle fuzz blowing off in the summer. Many local organic fields turn yellow with wild mustard for a couple weeks every year until the petals fall off. You bashing conventional farming is not going to gain many converts. When you look at the young people getting into agriculture these days for the most cases they are part of a large successful conventional farm. Maybe its just me but I would be hard-pressed to find many organic farms that have enjoyed the financial success that many conventional farms have. Maybe a newer pickup, shop, big flat bottom grain bins, and the odd warm holiday are not an indication of success but it cant be far from it particularly if it spans more than one generation. If you Austranada are really sincere in believing that we should "see the light" and not being the troll to get under our skin, Im all ears. We all want to make more money. Please share it publicly if possible. I too think this is a conversation worth having. And I still haven't given up that you may have something productive and positive to offer. Last edited by AlbertaFarmer5; Apr 13, 2019 at 22:34. Apr 14, 2019 | 02:50 12 Awesome article. Great to see this happening. This year’s wool check, for Mallee.